Motorcycle camping bridges the gap between vehicle camping and backpacking, offering the best of both worlds - more freedom than camping with a car or RV, but more mobility than travelling on foot. The amount of gear you'll need to buy for your motorcycle camping adventure depends on several factors. Some folks will already have things like tents, sleeping bags, and camping equipment on hand and will only need to buy a few bike-specific items. Some riders will want to wing it with nothing but a basic map, while others will want the latest and greatest GPS unit, along with gourmet cooking tools. It's all up to the individual, and it's all good. It's not possible to include all you need to know about choosing the right gear for your motorcycle camping adventure on one webpage. The items on this page are meant to point you in the right direction and give you an idea of what to search for if you need more information. If you see a piece of gear on this page but it's not exactly right for your trip, at least you'll be able to do more research on your own. Start by making a wish list of gear and supplies and once you've compiled a basic list you can do more product research through the manufacturers websites to get prices and specs Amazon is always a good place to start (especially for beginners), but the Touratech, and Happy-Trail websites are also good places to get more info on adventure camping supplies. If you're going on a short journey or if your route is compromised of a series of small towns located on blacktopped roads you might not even need a camping stove or cooking gear. Carrying a stove also means carrying a few cooking utensils (pot, bowl, fork, etc) as well as food, so bear in mind that it's kind of a package deal, but if you have the room and want to bring a camping stove there are numerous options. A stove that uses gasoline is a practical choice because you have a ready supply of fuel in the bike's gas tank so you won't need to carry an extra bottle of propane. The Coleman Sportster II (pictured) and the MSR XGK EX dual-fuel stove are both good choices. When searching the Internet there are a few different search terms to use if you want to compare camping stoves. Try 'camping stoves' with the words multi-fuel, liquid fuel, or dual fuel added. If you want a gasoline-specific stove you need to use the whole word 'gasoline' otherwise you'll get other gases (butane, propane, etc) included in the search. The nature of dual-sport riding can take you into some rough country so even if your bike is brand new you should still bring along a basic tool kit. Motion Pro has a great selection of motorcycle tool kits that fit into small spaces including their multi-purpose metric tool kit, and the Arsenal roll-up tool kit (pictured) are both available on Amazon. When buying tools sets, don't forget to check whether your bike needs metric or standard size. When it comes to spare parts, the more popular the bike the easier it will be to get parts, even in the more remote locations. Finding parts for a 1946 Indian Scout is going to be much more difficult than finding parts for the long-running Honda XR 650, so the Indian owners will need to pack accordingly. You'll also need tools to be able to change a tire, which is discussed on our How to Change a Dirt Bike Tire article. An all-around multi-tool is another must-have. Leatherman, Gerber and Victorinox all have a great selection of multi-tools, and you can check our Multi-Tool article for more info, or look into a basic survival kit on Amazon instead, which sometimes includes a basic multi-tool. The duration of your trip, number of people using the tent, available space on the bike racks or in the panniers, and the climate of your journey will dictate the size, weight, and design of your tent. Just remember that your tent is going to be your home away from home, so buy a decent one. Get a tent with taped seams, reinforced corners, and double stitching on all grommets. The Vuz Moto motorcycle tent and Harley-Davidson motorcycle tent (both available on Amazon), are good choices for one or two people, and also offers shelter (and security) for your bike and gear. Vestibules are a nice addition, but it might be a better option to go up one size, meaning for two people get a three-person tent. The extra space will allow you to store your gear inside the tent and if it's really cold in the morning, your clothes will be at arm's reach and you'll have enough room to get dressed inside the warmth of your sleeping bag. Sleeping bags come in many shapes, sizes and features (extra fleece in the foot section, big/tall sizes, double zippers, built in pillows, etc.) and the only way to decide which sleeping bag to buy is to read through some of the features and decide what's important, as well as how much you want to spend. Just remember that if it gets too hot, you can always sleep on top of the bag, but if it gets too cold, you'll be miserable if your sleeping bag isn't rated properly for the cold temps. A down sleeping bag is a great choice (although more expensive), but you need to make sure you have a waterproof pannier or duffel bag to store it in because once down gets wet, it takes forever to dry and will quickly start to lose its insulative qualities. The Coleman North Rim synthetic bag and the Kelty Cosmic sleeping bag are both good choices. If you have the room, consider an air mattress and sleep sack, especially if your trip is lengthy. Therm-a-Rest and ExPed make excellent air mattresses that don't take up excessive space and make a world of difference when it comes to comfort. ExPed and Therm-a-Rest brands are both well-established and the Exped SynMat 9 and Therm-a-Rest Trail Scout are two examples of their gear, and both are available on Amazon. If you decide to buy an air mattress it's a good idea to get one that includes some kind of pump system (even if it's just a bellows-type pump), especially if you're headed to a cold climate. Blowing up the mattress yourself is the last thing you want to do after a day out on the trails, and your breath can introduce moisture, which could freeze inside the mattress during the night if it drops below freezing. Once you've decide how much gear you'll be taking you can start looking for a way to transport that gear. Panniers fall into two basic categories: hard and soft. Hard panniers, which are usually aluminum or plastic have pluses: durability, security, can be used as seats, tables or cooktops, and are weathertight. They have a few minuses as well: higher cost, a bit heavier than soft panniers, won't get smaller if you shed gear, and if they're wider than the handlebars it can make the bike harder to maneuver in tight places. Search terms vary so try motorcycle luggage, expedition bags, saddlebags, etc. when doing your research. Adding the word 'motorcycle' to your search is a good idea in order to eliminate bicycle panniers from the search results. You can also try rear rack bags, tank bags, and top tail bags. 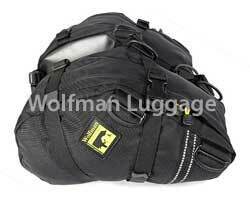 The Wolfman Luggage E-12 soft saddle bags are pictured and are available on Amazon . Soft pannier packs are basically the opposite as far as pluses and minuses: they're less secure, some are less weatherproof, and can only be used as seats or tables if they're full of gear. The pluses are that if you've over-packed, the soft bags will become smaller as you shed gear thus taking up less space and weight, they're 'scrunchable', so they rarely protrude beyond the width of the handlebars, and they're usually less expensive than hard panniers. Whichever pannier you choose, you'll need to check that they'll fit your bike, especially with the hard panniers. If you find an inexpensive pannier but you need to spend another $400 to retro-fit your bike to carry it, it may not be that good of a deal. That should get you started and give you some idea of the gear you might need for your Awesome Motorcycle Camping trip. The items shown on this page are only a smattering of what's available, so spend a rainy afternoon just window shopping across the Internet.